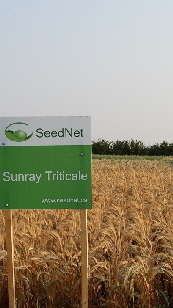 Sunray is a spring triticale that is adapted to the Canadian prairies and represents an improvement in ergot resistance for Canadian triticale. Sunray is resistant to the prevalent races of leaf rust, stem rust, common bunt and common root rot and is moderately resistant to grain sprouting. Sunray is short-statured with excellent lodging resistance and grain yield; grain volume test weight and seed mass were similar to the check cultivars. Sunray matures 2 days earlier than Pronghorn and AC Certa, and similar to AC Ultima.